PORTLAND, Ore. (AP) — LaMarcus Aldridge had 32 points and 10 rebounds and the Portland Trail Blazers prevailed for a 116-112 overtime victory over the Los Angeles Clippers on Thursday night. The Blazers have won seven of their last eight games and they’ve dropped just two games at home this season. But the Clippers, playing the second of a back-to-back, mounted a challenge after trailing by as many as 11 points early in the second half. Blake Griffin had 35 points and 11 rebounds, while Chris Paul finished with 34 points and 16 assists. 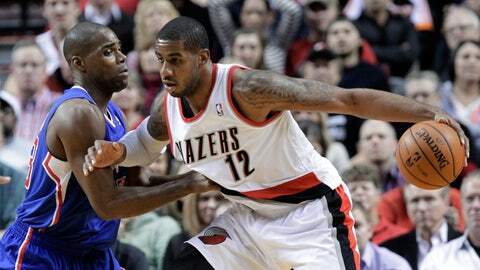 Aldridge started for the Blazers even though he was a game-time decision because he had his wisdom teeth pulled. He hit a fadeaway with 39 seconds left in overtime and Portland went ahead 110-109. The Blazers were coming off 110-107 victory New Orleans last Saturday. Earlier Thursday, the NBA said its referees made a mistake when they ejected Griffin in the Clippers’ 105-103 loss to the Warriors on Wednesday night. "A common foul should have been called on Griffin for initially attempting to dislodge the Warriors’ Andrew Bogut and a technical foul should have been assessed to Bogut for grabbing Griffin by the shirt and wrestling with him," Rod Thorn, the NBA’s president of basketball operations. Clippers coach Doc Rivers said before the game against the Blazers that he thought Griffin handled the situation well. It was the second ejection for the Clippers in as many games. Forward Matt Barnes was ejected with 56 seconds left in the third quarter of a 120-116 OT win over the Minnesota Timberwolves on Sunday night. Barnes fouled Kevin Love. Paul’s 3-pointer that closed the Clippers to within 47-46 at the intermission. Portland pulled ahead 61-43 in the third quarter but Aldridge picked up his fourth foul and the Clippers went on an 8-0 run to make it 61-59. Undaunted, Batum hit a 3-pointer to tie it at 101 with 5.3 seconds to go. Paul missed a 17-footer at the jumper to send the game into overtime. Notes: The game was the first of three meetings between the two teams this season. The Clippers claimed last season’s series 3-1. … The Clippers’ 14 first-quarter points are the fewest they’ve scored in the first quarter. … DeAndre Jordan finished with 19 rebounds before fouling out in overtime. … Barnes also fouled out in OT.